My name is Mutsunori Yamamoto living in Kameoka-shi KYOTO JAPAN. I have known ShiretokoIozan since I was a child. The summer in 2005 was the first time I visited there. I traveled more than 2000 km by car from KYOTO at the first visit. Since then I have visited there every summer and researched the Phreatic Explosion Crater. In 2014, I left home on July 1 for Shiretoko Iozan by a small motor bike with a lot of loading on it. I took a ship for 20 hours from Maizuru to Otaru in Hokkaido, northern island of Japan, and then I rode my moter bike to Utoro, nearest town to the volcano. I started two months and a half research on Shiretokoiozan. 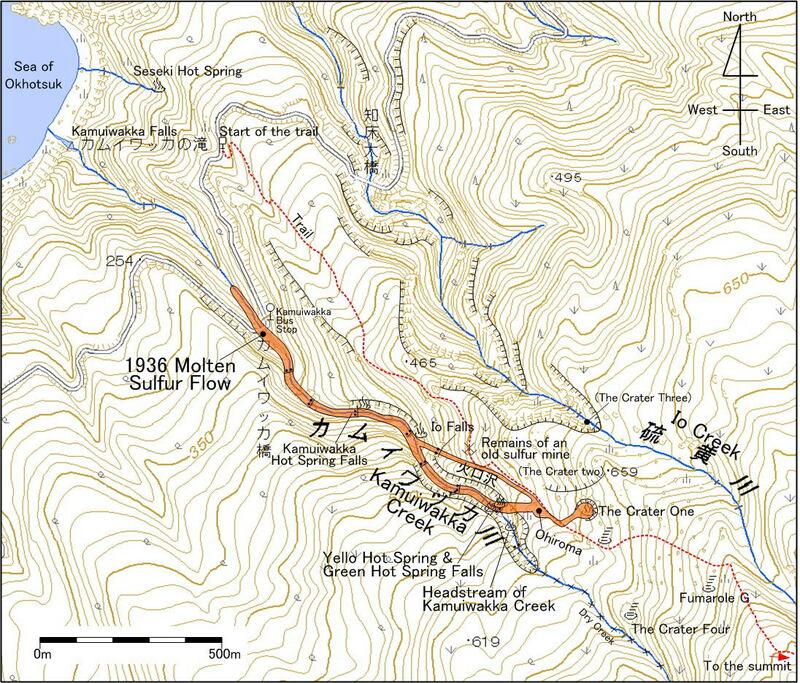 This map above shows the molten sulfur eruption site and its flow channel and mountain trail. Whiel you read this article, please check this map to figure out what part of this area I am talking. 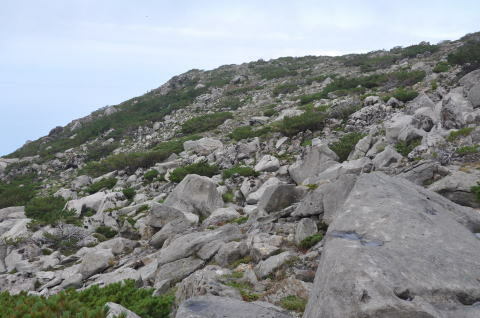 About 30 minutes after I left the starting point of the ShiretokoIozan Trail I come to this view point. 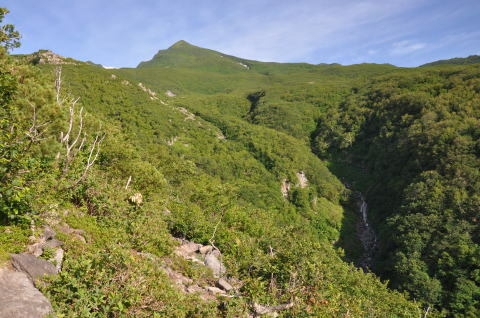 The small and deep creek on the right of this photograph is Kamuiwakka Creek. In 1936, huge amount of molten sulfur flowed in this creak and it was filled with yellow sulfur after the eruption. I took the photograph on the left above and on the other hand, right photograph was taken by Dr. Wananabe in 1936. 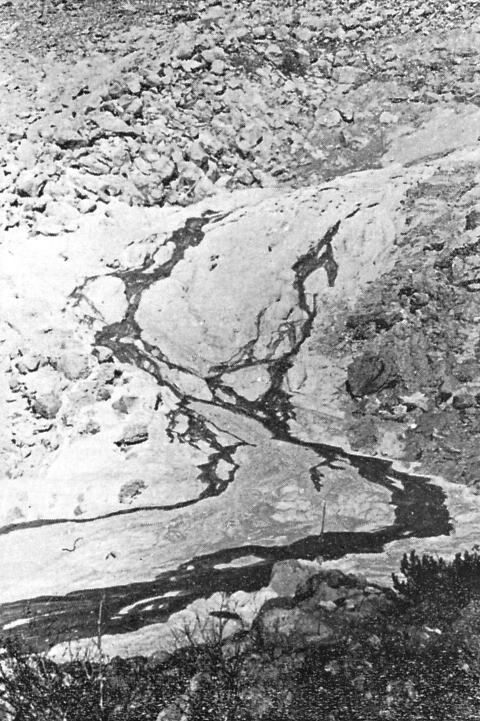 You can see sulfur on the black and white photograph in the dried creek. Because the eruption in 1936 took place right before the China-Japan War and World War Two, almost all the sulfur was taken away by miners for gun powder. When I walked along the trail, I must keep ringing bells to let bears know a man is walking. Bears will escape from man as he hear the bell. I also have an anti-bear spray for emergency situation. 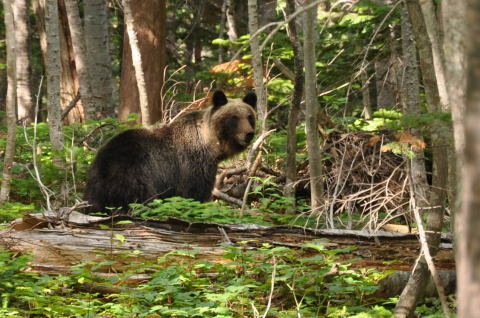 I have never used the anti-bear spray but I have once taken it out of my bag and about to shoot a bear when he was appear seven meters ahead of me (actually "I" appeared in front of him as I was walking down the trail). But he was only eating something on the ground and he was not interested in me. The photograph on the left is Kamuiwakka Creek in 2014. I climbed a rock formation to take this picture. There is no sulfur in it today. But in 1936 the creek was full of yellow sulfur as the photograph on the right. I believe some day Shretokoiozan will erupt sulfur. We might see this fantastic view in some days. 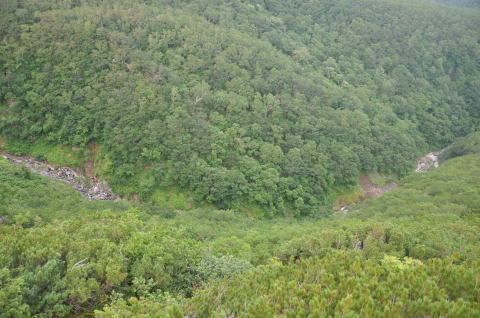 I climbed huge rock formation in Kakosawa dry creek and then bare hill called "Shinfunkako." In this area I could see fumaroles and heat altered spots and craters. Huge white andesite rocks scattered around here. I guess those those rocks were separated from a few large lava sheet by thermo altering by volcanic gas. Decayed clay and sand probably outgushed from this area and huge rocks remained. This photograph which I took on July 5, 2014 is the molten sulfur erupting crater, "The Crater One." It is called, by geologist, "Explosion Crater" but I am NOT sure because there is no ejecta, or volcani cinders, around this crater. 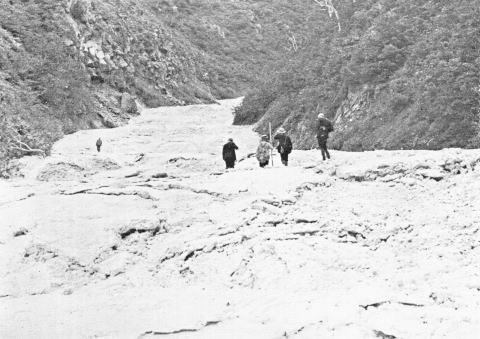 During the erupting days in 1936, the Crater One was full of solid sulfur and brown molten sulfur came out once in four or five days. When you watch this photgraph very closely, you could find yellow band in the lower part of this picture. It is a hot spring water flow. Under the big rock at the right in the center there is an orifice where hot water coming out. 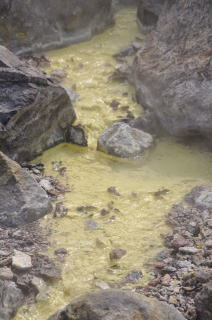 In the hot water stream, solid sulfur crystal grows on the rocks, and that is why the stream looks yellow. Hot water itself has no color. Let's watch the hot spring stream closer. 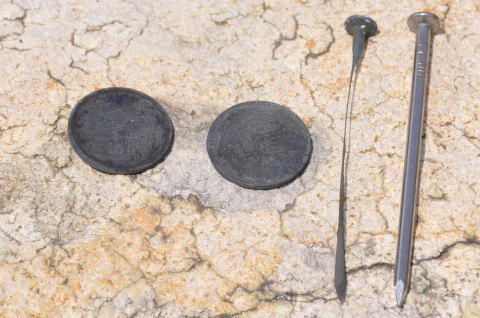 Because the hot spring water was as acid as ph=2, and its temperature was 92 degrees Celsius, iron nail decayed very easily. When I put an iron nail into the stream in the morning and when I saw it in the evening, the nail was very narrow just like a string just as the photograph shows below. The iron nail at far right was a new one. Next one was a nail soaked in the acid hot spring for several hours. There are two cupper ten-yen coins on the left. On another day, I cooked some eggs in this stream. 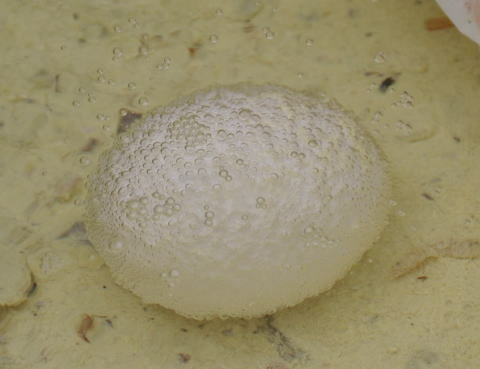 As put some eggs in the hot acid water, it started buble and a lot of bubles covered the whole body of egg. A couple hours later I took the eggs out of the hot water. Shells were very thin and not smooth. But eggs were good tasted! This is the eastern crater wall. Because fumarole gas and hot spring in the Crater One are very acid, rocks in the crater decay into white sand or clay. You can recognize yellow substance on the wall. It seemed that those were the section of underground structure of fumaroles. This time I could not see much gas coming out here but in August more gas gushed here. It seems that while hot spring stops more gas gushes out, and when hot spring is welling out, gas stops. Miners in 1936 took almost all the sulfur in the Crater One but still we could see some pieces of sulfur here. 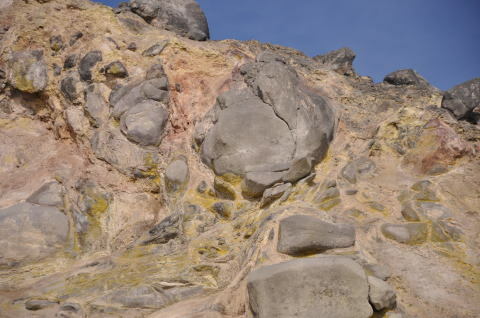 If you looked into under huge rocks in the crater, you might find a strange sulfur as the photograph shows above. 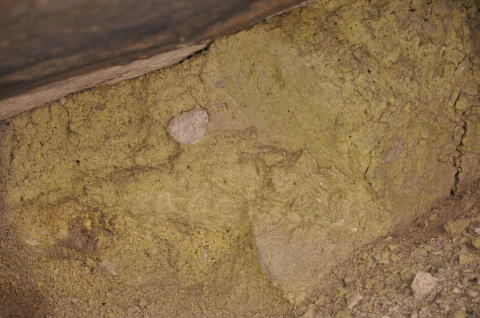 The piece of sulfur, yellow but greenish, has small cavities. This sulfur lump should be called "sulfur lava." Because the melted sulfur contained gas when it was molten sulfur, it has gas cavities like this above. In the scale one mark equal 1 cm long, so so this piece is approximately seven centimeters wide. 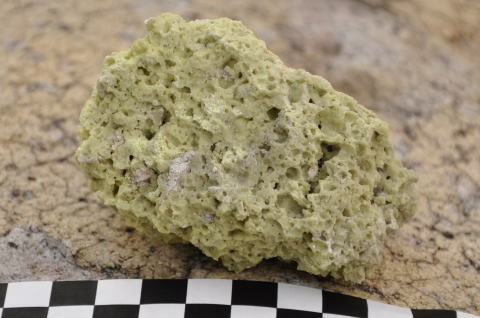 This sulfur lava piece also contains white rock pieces in it. As the molten sulfur was coming out of the orifice it contained rocks in the vent. 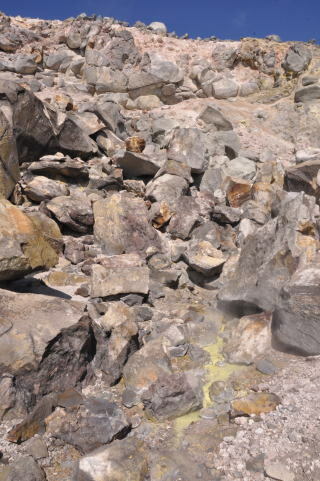 Sulfur stuck between huge rocks close to the hot spring wellding site. You can see a white rock in the upper left in the picture. 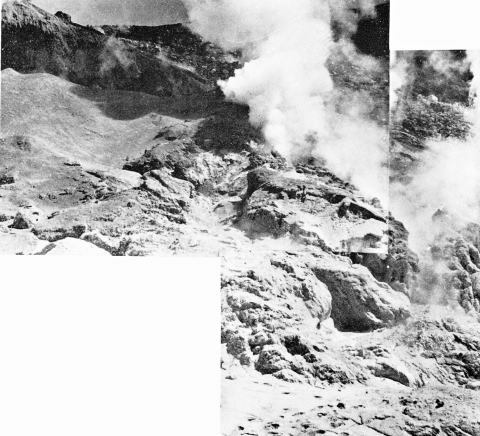 During the eruption in 1936, the Crater One was fulfilled with sulfur and once in several days it spouted molten sulfur. Dr. Watanabe, professor at Hokkaido University who observed this eruption, took those black and white photographs. 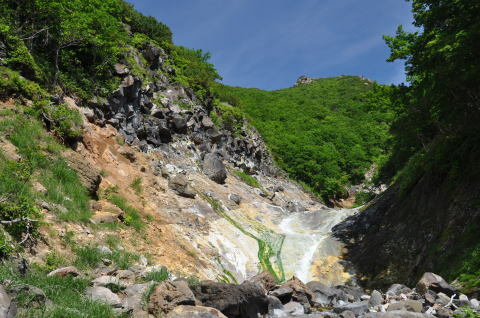 He reported brown liquid sulfur spilt out of the crater and flowed into Kakonosawa Dry Creek. The monochrome photograph above was taken at the Kamuiwakka Hot Spring Falls in 1936. I took the color photograph in 2013 at the same place as the black and white picture. 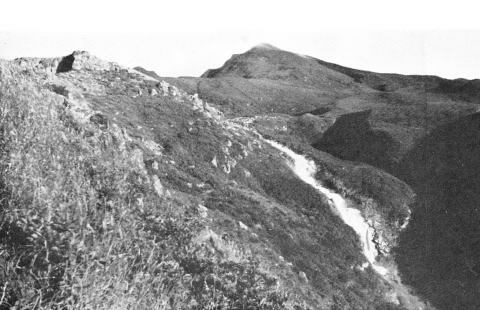 The rocky cliff on the left in the color photograph can be seen in the monochrome photograph. The big rock in the color photograph at the cliff was there in 1936 and seen in the old photograph too. You might figure out how deep the sulfur was in that time by comparing both photographs. The acid hot spring, about 65 degrees Celsius, welled at the border of rock and lower stratum below. Until 2005, a lot of pelple could bathe at the falls basin. But Japanese central government and local government prohibited people to come to there. They tells it is dangerous to walk in this area due to falling rock from the cliff. But I do not think so. Rocks falls sometimes but usually they falls when it is raining. So it is not so dangerous to just walk up there and baathe. In fact no one has been injured there by falling rocks. During the day there is some guards and they prevend people coming in the creek but in the evening they will leave. It is about 30 minutes creek-upclimbing to the wild hot spring from Kamuiwakka Bus Stop. The green stream at the falls is special bacteria living in acid hot spring. Black and white photographs are all taken by late Dr. Takeo Watanabe during his observation in 1936. You might be interested in bears in Shiretoko. Yes I see bears often when I research in the mountain. One day as I was measuring electric currency and voltage in the mountain, a bear was staring hard at me. It was scaring! I said "what! Why are you staring so hard at me." Then I found she had two children beside her. Soon they ran away from me while I yelled "Hey! Wait. Let me take a picture!." 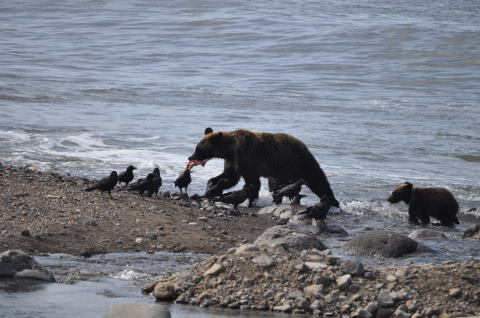 Another day I visited sea shore and saw a big bear catching pink salmon. She walked into the sea and caught one and gave it to her child. Soon after that another bear visited the shore to catch fishes. It was a big fun! to watch them fishing in the ocean. Some people are afraid of bears but they do not attack us. They are peace loving species. Even Human beings are more war-loving species. They are brown bears same as ones living in North America. They seems to have come along Kamchatskaya Peninsula to Hokkaido.